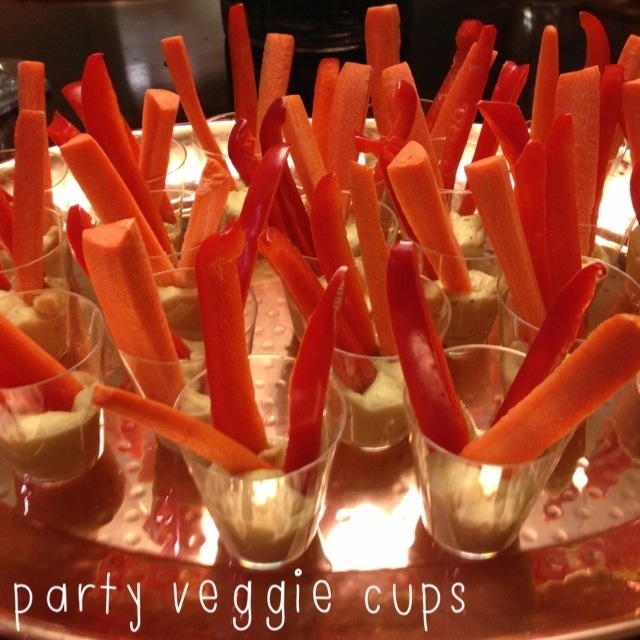 party veggie cups | Is there any wine left? This is not a recipe. Its just the easiest thing ever. I had a trunk show for my cute college friend Cassie recently to showcase her amazing jewelry designs. Check her out! I served moscato mojitos, wine, and light bites. And instead of putting out a veggie tray and dip, I filled little plastic shot glasses (available at party stores) with hummus and stuck a few slices of bell peppers and carrots in them. That way, people could easily pick them up and carry them around while chatting and looking at the jewelry. You don’t have to use hummus — you could use Ranch dressing or Freda’s White Bean Dip or whatever else you feel like. This would also be an easy way to serve apples and peanut butter or other similar snacks at a kid’s birthday party.